Charmian London : Surf-riding at Waikiki, 1907-1917. The Macmillan Company, New York, Boston, Chicago, Dallas, Altanta, San Francisco. 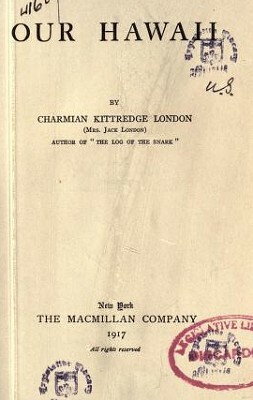 Macmillan and Co, Ltd, London, Bombay, Calcutta, Melbourne. Macmillan Co of Canada, Ltd, Toronto. 1917.
by the Ontorio Legislative Library, 1980. The London's first met Alexander Hume Ford. at the Royal Hawaiian Hotel, Honolulu, Thursday, May 30, 1907. The Snark, and the owner ashore. cool corner talking of our visit to the Beach, when a bearded young man stepped briskly up, with "You're Jack London, aren't you? My name is Ford." "Oh, yes," Jack returned, quickly on his feet. "Alexander Hume Ford. I heard you were in Honolulu, and have wanted to see you. I've read lots of your stuff and all of your dandy articles in The Century." Mr. Ford could hardly spare time to look his pleasure, nor to be introduced to me, before rushing on, in a breathless way that made one wonder what was the hurry : "Now look here, London," in a confidential undertone. "I've got a lot of whacking good material for stories, you understand. / can't write stories there's no use my trying. My fiction is rot rot, I tell you. I can write travel stuff of sorts, but it takes no artist to do that. You can write stories the greatest stories in the world and I'll tell you what : I'll jot down some of the things I've got hold of here and everywhere, and you're welcome to them ... What d'you say? Jack suggested that he make three at our table, and he talked a steady stream all through of information about everything under the sky, it would seem, for he has traveled widely. At present he is interested in reviving the old Hawaiian sport of surf-boarding on the breakers, and promised to see us at Waikiki later on, and show us how to use a board. When he left, we were able to draw the first long breath in two hours. In his atmosphere one had the sense of being speeded up; but his generous good nature was worth it. hours without necessarily going out of depth on the sandy bottom. The cream-white curve of beach is for miles plumed with coconut palms, and Diamond Head, "Leahi,"
that loveliest of old craters, which rounds in the south-eastern end of the graceful crescent, is painted by every shifting color, light, and shade, the day long, on its rose-tawny, serrated steeps. And many's the sail comes whitening around the point, yacht or schooner or full-rigged ship, a human mote (?) that catches the eye and sets one a-dreaming of lately hailed home harbors and far foreign ports with enchanting names. We keep repeating the word, for already it spells a new phase of existence. Here but a scant twenty-four hours, and already Jack's Dream Harbor seems faint and distant, slipping into a mild and pleasant, not imperative memory, for the spirit of storied Waikiki has entered ours. The air seems full of wings, Iam so happy making home, this time a tent. Not twenty feet in front, where grass grows to the water's edge at highest tide, the sands, sparkling under blazing sunrays, are frilled by the lazy edges of the surf; and the flawed tourmaline of the reef-waters, pale green, or dull pink from underlying coral patches, stretches to the low white line of breakers on the barrier reef some half-mile seaward, while farthest beyond lies the peacock-blue ribbon of the deep-sea horizon. Before breakfast, it is into the blissful warm tide, diving through bubbling combers, coming up eyes level with tiny sails of fishermen beyond the barrier reef. All hours one hears the steady, gentle boom and splash of the surf not the big disturbing, ominous gnashing and roaring of the Pacific Coast rollers, nor the distant carnivorous growlings off the rock-jagged line of New England. And under sun or moon, it is all a piece of beauty. Toward Diamond Head, when the south wind drives, the swift breakers, like endless charges of white cavalry, leap and surge shoreward, flinging back long silver manes. The thrill of these landward races never palls at Waikiki. One seems to vision Pharaoh's Horses in mighty struggle against backwashing waters, arriving nowhere, dying and melting impotent upon the sand. Jack, to whom beauty is never marred by knowledge of its why and wherefore, has explained to me the physics of a breaking wave. "A wave is a communicated agitation," he says. "The water that composes a wave really does not move. If it moved, when you drop a stone in a pool and the ripples widen in an increasing circle, there should be at the center an increasing hole. So the water in the body of a wave is stationary. If you observe a portion of the ocean's surface, you will see that the same water rises and falls endlessly to the agitation communicated by endless successive waves. Then picture this communicated agitation moving toward shore. As the land shoals, the bottom of the wave hits first and is stopped. Water is fluid, and the upper part of the wave not having been stopped, it keeps on communicating its agitation, and moves on shoreward. Ergo," says he, "something is bound to be doing, when the top of a wave keeps on after the bottom has stopped, dropped out from under. to fall, forward, down, cresting, overcurling, and crashing. So, don't you see ? don't you see ? " he warms to his illustration, "it is actually the bottom of the wave striking against the rising land that causes the surf ! And where the land shoals gradually, as inside this barrier reef at Waikiki, the rising of the undulating water is as gradual, and a ride of a quarter of a mile or more can be made shoreward on the cascading face of a wave." 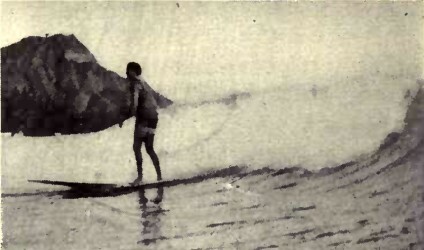 Alexander Hume Ford, true to promise, appeared to-day with an enormous surf-board, made fun of the small ones that had been lent us, and we went down to the sea to learn something of hee-nalu, sport of Hawaiian kings. The only endeaver of fish, flesh, and fowl, which Mr. Ford seems not to have partially compassed, is that of the feathered tribe undoubtedly from lack of time, for his energy and ambition seem tireless enough even to grow feathers. Jack, who seldom stops short of what he wants to accomplish, finds this man most stimulating in an unselfish enthusiasm to revive neglected customs of elder islands days, for the benefit of Hawaii and her advertisement to the world. Although we have seen a number of natives riding the breakers, face downward, and even standing upright, almost no white men appear to be expert. Mr. Ford, born genius of pioneering and promoting, swears he is going to make this islands pastime one of the most popular on earth, and, judging by his personal valor, he cannot fail. The thick board, somewhat coffin-shaped, with rounded ends, should be over six feet long for adults. This plank is floated out to the breaking water, which can be done either wading alongside or lying face-downward paddling, and there you wait for the right wave. When you see it coming, stand ready to launch the board on the gathering slope, spring upon it, and keep on going if you can. Lie fiat on your chest, hands grasping the sides of the large end of the heavy timber, and steer with your feet. expert, having gauged the right speed, rises cautiously to his knees, to full stature, and then, erect with feet in the churning foam, makes straight for the beach, rides up the sparkling incline, and steps easily from his arrested sea-car. A brisk breeze this afternoon, with a rising surf, brought out the best men, and we saw some splendid natives at close range, who took our breath away with their reckless, beautiful performance. 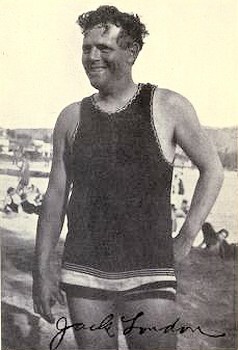 One, George Freeth, who is only one quarter Hawaiian, is accounted the best surf-board rider and swimmer in Honolulu. When a gloriously bodied kanaka, naked but for a loin-cloth carved against his shining bronze, takes form like a miracle in the down-rushing smother of a breaking wave, arms outstretched and heels winged with backward-streaming spray, you watch, stricken of speech. And it is not the sheer physical splendor of the thing that so moves one, for lighting and informing this is an all dominating spirit of joyful fearlessness and freedom that manifests an almost visible soul, and that lends a slow thrilling of awe to one's contemplation of the beauty and wonder of the human. What was it an old Attic philosopher exclaimed? "Things marvelous there are many, but among them all naught moves more truly marvelous than man." And our journalist friend, malihini, white-skinned, slim, duplicated the act, and Jack murmured, " Gee ! What a sport he is and what a sport it is for white men too !" His glowing eyes, and a well-known firm expression about the jaw, told me he would be satisfied with nothing less than hours a day in the deep-water smokers. As it was, in the small surf, he came safely in several times. I accomplished one successful landing, slipping up the beach precisely to the feet of some stranger hotel guests, who were not half so surprised as myself. It took some while to learn to mount the board without help, for it is a cumbrous and unruly affair in the heaving water. bathers, but comparatively few women, except close in-shore. A fleet of young kanaka surf -boarders hovered around Ford and his haole pupils, for he loves children and is a great favorite with these. Often, timing our propelling wave, we would find a brown and smiling cherub of ten or so, all eyes and teeth, helpfully timing the same wave, watching with altruistic anxiety lest we fail and tangle up with the pitching slice of hardwood. Not a word would he utter but in every gesture was "See! See! This way! It is easy!" Several times, on my own vociferous way, I was spilled diagonally adown the face of a combing wave, the board whirling as it overturned and slithering up-ended, while I swam to bottom for my very life, in fear of a smash on the cranium. And once I got it, coming up wildly, stars shooting through my brain. And once Jack's board, on which he had lain too far forward, dived, struck bottom, and flung him head over heels in the most ludicrous somersault. His own head was struck in the ensuing mix-up and we were able to compare size and number of stars. Of course, his stars were the bigger because my power of speech was not equal to his. It seems to us both that never were we so wet in all our lives, as during those laughing, strenuous, half -drowned hours. Sometimes, just sometimes, when I want to play the game beyond my known vitality, I almost wish I were a boy. I do my best, as to-day ; but when it comes to piloting an enormous weighty plank out where the high surf smokes, above a depth of twelve to fifteen feet, I fear that no vigor of spirit can lend my scant five-feet-two, short hundred-and-eleven, the needful endurance. It's easier than you think but better let your husband try it out first." 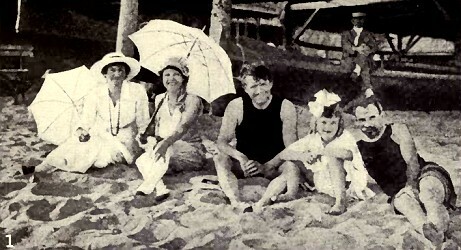 WAIKIKI, Sunday, June 2, 1907. An eventful day, this, especially for Jack, who is in bed thinking it over between groans, eyes puffed shut with a strange malady, and agonizing in a severe case of sunburn. nasties of the past forty-eight hours. Our program to-day began at ten, with a delirious hour of canoe riding in a pounding surf. While less individual boldness is called upon, this game is even more exciting than surf-boarding, for more can take part in the shoreward rush. The great canoes are themselves the very embodiment of royal barbaric sea spirit dug whole out of hard koa logs, long, narrow, over two feet deep, with very slightly curved perpendicular sides and rounded bottoms ; furnished with steadying outriggers on the left, known as the "i-a-ku" - two long curved timbers, of the light tough hardwood, with their outer ends fastened to the heavy horizontal spar, or float, of wili-wili, called the "a-ma." The hulls are painted dull, dead black, and trimmed by a slightly in-set, royal-yellow inch-rail, broadening upward at each end of the boat, with a sharp tip. There is an elegance of savage warlikeness about these long sable shapes ; but the sole warfare in this day and age is with Neptune, when, manned by shining bronze crews, they breast or fight through the oncoming legions of rearing, trampling, neighing sea cavalry. It required several men on a side to launch our forty-foot canoe across sand into the shoring tide, and altogether eight embarked, vaulting aboard as she took the water, each into a seat only just wide enough. Jack wielded a paddle, but I was placed in the very bow, where, both out and back, the sharpest thrills are to be had. As the canoe worked seaward in the high breaking flood, more than once breath was knocked out of me when the bow lunged right into a stiff wall of green water just beginning to crest. Again, the canoe poised horizontally, at right angles to the springing knife-edge of a tall wave on the imminence of overcurling, and then, forward-half in midair, plunged head-into the oily abyss, with a prodigious slap that bounced us into space, deafened with the grind of the shore-going leviathan at our backs. abating tumult of sound, as he watched me trimming my lines so as to present the least possible surface to the next briny onslaught. noise, that I was having the time of my life, as, from his own past experience, he had told me I would have. It was more than usually rough, so that our brown crew would not venture out as far as we had hoped, shaking their curly heads like serious children at the big white water on the barrier reef. that brought about the turning of the stern seaward to a low green mounting hill that looked half a mile long andridged higher and higher to the burst. "'A hill, a gentle hill, Green and of mild declivity.'. . . It is not!" Fred Church quoted and commented on his Byron and the threatening young mountain, with firm hands grasping his paddle, when, at exactly the right instant, he joined the frantic shrill ''Hoe ! Hoe ! '' (Paddle ! paddle like everything!) that sent all paddles madly flying to maintain an equal speed with the abrupt, emerald slope. Almost on end, wiki-wiki, faster faster, and yet faster, we shot, over the curl of white water behind, above, overhanging, menacing any laggard crew. Once I dared to look back. Head above head I glimpsed them all ; but never can fade the picture of the last of all, a magnificent Hawaiian sitting stark in the stern, hardly breathing, curls straight back in the wind, his biceps bulging to the weight of canoe and water against the steering paddle, his wide brown eyes reflecting all the responsibility of bringing right-side-up to shore his haole freight. And then the stern settles a little at a time, as the formidable seething bulk of water dissipates upon the gentle up-slope of the land before the Moana, while dripping crew and passengers swing around in the backwash and work out to repeat the maneuver. Few other canoes were tempted into the surf to-day, but we saw one capsize by coasting crookedly down a wave. The yellow outrigger rose in air, then disappeared in crashing white chaos. Everything emerged on the sleek back of the comber, but the men were unable in the ensuing rough water to right the swamped boat. We lost sight of them as the next breaker set us zipping inshore, but on subsequent trips saw them swimming slowly in, towing the canoe bottom-upward, like a black dead sea monster, and apparently making a picnic of their disaster. An hour of this tense and tingling recreation left us surprisingly tired, as well as cold from the strong breeze on wet suits and skins. Mr. Ford, with a paternal "I-told-you-so" smile at our enthusiasm over the canoeing, was prompt for the next event on our program, which was a further lesson in surf -boarding. wahine surf, as the native swimmers have it, and manful-wise ride the big water. Our friend had a thorough pupil in Jack, who with characteristic abandon never touched foot to bottom in four broiling hours. Here at the Beach life is so gay there is hardly chance to sleep and work, what with arrivals of transports and their ensuing dinners and dances in the hotel lanai, swimming and surf -boarding under sun and moon very circumspectly under the sun! One fine day we essayed to ride the breakers in a Canadian canoe, and capsized in a wild smother exactly as we had been warned. I stayed under water such a time that Jack, alarmed, came hunting for me ; but I was safe beneath the overturned canoe, which I was holding from bumping my head. He was so relieved to find me unhurt and capable of staying submerged so long that promptly he read me a lecture upon swimming as fast as possible from a capsized boat, to avoid being struckin event of succeeding rollers flinging it about. WAIKIKI, Friday, June 28, 1907. To Mr. Ford we owe a new debt of gratitude. And so does Hawaii, for such another promoter never existed. All he does is for Hawaii, desiring nothing for himself except the feverish, unremitting pleasure of sharing the attractions of his adopted land. Mr. Cleghorn also suggested that he could arrange a private audience with Queen Liliuokalani at her residence in town, if we desired. letter of introduction to her from Charles Warren Stoddard, who knew her in the days of her tempestuous reign. He and Jack have called each other Dad and Son for years, although acquainted only by correspondence. But we have little wish to intrude upon the Queen, for it can be scant pleasure to her to meet Americans, no matter how sympathetic they may be with her changed state. Long we rested on the Goodhue lanai to-night, and long the shadowy leper orchestra serenaded beyond the hibiscus hedges, while some one recalled a story of Charles Warren Stoddard's "Joe of Lahaina," in which a Hawaiian boy, bright companion of other days, crept to the gateway in the dusk, and there from the dust called to his old friend. Forever separated, they talked of old times when they had walked arm in arm, and arms about shoulders, in Sweet Lahaina. KALEINALU, MAUI, Tuesday, July 23, 1907.
with finest of sand for the babies to play in, and exciting surfing inside protecting reef, for swimmers. 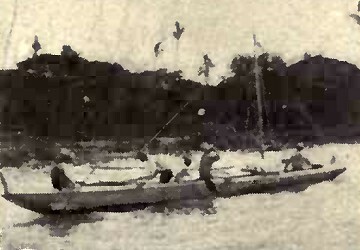 HOLUALOA, Thursday, August 22, 1907. Winning through the belt of shrubbery, we traversed a desert of decomposed lava, our path edged pastorally with wild flowers, among them the tiny dark-blue ones of the indigo plant. feet wide of irregular lava blocks, flanked either side by massive, low walls of lava masonry several feet thick. This amazing slide extends from water's edge two or three miles up-mountain, and its origin, like the ambitious fish ponds, is lost in the fogs of antiquity. Its probable use was for the ancient game of holua coasting on a few inches-wide sledge papa holua with runners over a dozen feet long and several inches deep, fashioned of polished wood, hard as iron, curving upward in front, and fastened together by ten or more crosspieces. The rider, with one hand grasping the sledge near the center, ran a few yards for headway, then leaped upon it and launched headforemost downhill. Ordinarily, a smooth track of dry pili grass was prepared on some long descent that ended in a plain; but this holualoa (loa connotes great), is supposed to have been sacred to high and mighty chief dom, whose papa holuas were constructed with canoe-bottoms. sledges, flashing with ever increasing flight adown this regal course until, at the crusty edge of the solid world, they breasted the surf of ocean ! Not a day passed before, in swimming-suits, we walked down Kalia Road to the Seaside Hotel, and once more felt underfoot the sands of Waikiki. But such changes had been wrought by sea and mankind that we could hardly believe our eyes, and needed a guide to set us right. The sands, shifting as they do at irregular periods of storm, had washed away from before the hotel, leaving an uninviting coral-hummock bottom not to be negotiated comfortably except at high tide, and generally shunned. 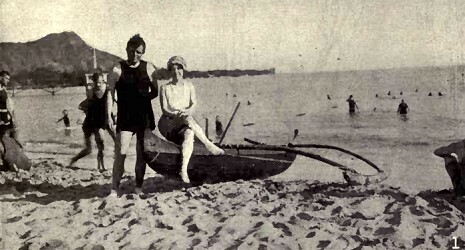 Waikiki, 1915. Mr and Mrs. London (center) A.H. Ford (right). A forbidding sea-wall buttressed up the lawn of the hotel, while the only good beach was the restricted stretch between where the row of cottages once had begun, and the Moana Hotel. And what had we here? large, raised dancing-lanai, underneath which reposed a fleet of great canoes, their barbaric yellow prows ranged seaward. At the rear, in a goodly line of tall lockers, stood the many surf-boards, fashioned longer and thicker than of yore, of the members of the Canoe Club. 1 At this writing, 1917, the sands are again level with the seawall, shoaling as far as the diving-stage, rendered useless for lack of deep water. were making their curving flights inside the breakers. Several patronesses of the Club give their time on certain days of the week, from the women's lanai inconspicuously chaperoning the Beach. Actually, the only landmark recognizable was the date-palm still flourishing where had once been a corner of our tent-house, now become a sheltering growth with yard-long clusters of fruit, and we were told it was known as the "Jack London Palm." For it might be said that in its shadow Jack wove his first tales of Hawaii. And all this progress meant Ford ! Ford ! Ford ! Everywhere one turned evidence of his unrelaxing brain met the eye. But he, in turn, credits Jack with having done incalculably much toward bringing the splendid Club into existence, by his article on surf -board riding, " A Royal Sport." 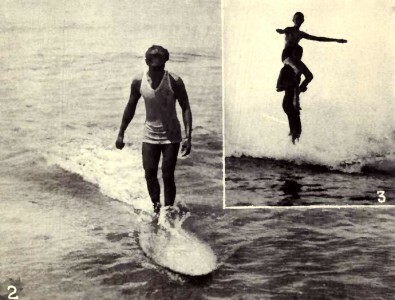 Largely on the strength of the interest it aroused, Mr. Ford had been enabled to keep his word to Jack that he would make surf -boarding one of the most popular pastimes in Hawaii. to the Queen's Hospital, which her Majesty had established, had set aside for the Club's use this acre of ground, which, with the enthusiastic revival of surf-boarding, was now become almost priceless. Queen Emma was the wife of Kamehameha IV, mother of the beautiful "Prince of Hawaii," who died in childhood, herself granddaughter of John Young, and adopted daughter of an English physician, Dr. Rooke, who had married her aunt, Kamaikui. The Queen owned this part of the Beach, from which her own royal canoes were launched in the good old days, and where she also used the surf-board. "Her estate holds this land," Ford had said in 1907, "and I'm going to secure it for a Canoe Club. I don't know how; but I'm just going to." (assistance) it might possibly prove in bringing about Ford's ambition for Waikiki. So keen had our friend been on the trail, that we had half wondered how soon we should be turned out of our Seaside quarters to make room for lumber and carpenters ! Upon the Beach at Waikiki it was seldom we missed the long afternoon. Jack worked in a kimono as of yore, his face and figure little changed, if more mature. 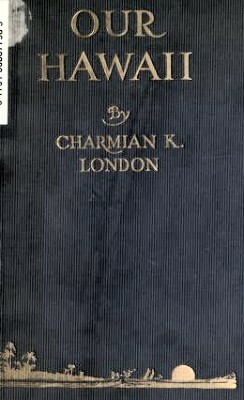 luncheon, in bathing suit, bearing towels and a white dangling bag of blue-figured Japanese crepe, knobby as a stocking at Christmas time with books and magazines selected from the boxes regularly shipped from the Ranch at home, and bountiful cigarettes and matches, he would be seen walking along Kalia Road with his light and merry gait to the Outrigger Club. And "I'm glad we're here now," he would ruminate; "for some day Waikiki Beach is going to be the scene of one long hotel. And wonderful as it will be, I can't help clinging, for once, to an old idea." Under the high lanai of the Outrigger, we lay in the cool sand between canoes and read aloud, napped, talked, or visited with the delightful inhabitants of the charmed strand, until ready to swim in the later afternoon. One special diversion was to watch several Hawaiian youths, the unsurpassed Duke Kahanamoku among them, performing athletic stunts in water and out. And that sturdy little American girl we had known before, Ruth Stacker, now a famous swimmer herself, could be seen instructing her pupils in the wahine surf. George Freeth, we heard, was teaching swimming and surf -boarding in Southern California. Our own swims became longer from day to day. Still inside the barrier reef, through the breakers we would work, emerging with back-flung hair on their climbing backs while they roared shoreward. Beyond the combing crests, in deeper water above the coral that we could see gleaming underfoot in the sunshafts, lazily we would tread the bubbling brine or lie floating restfully, almost ethereally, on the heaving warm surface, conversing sometimes most solemnly in the isolated space between sky and solid earth. Touched and gratified, I reminded him of the afternoon that first I swam to the Snark in Pearl Lochs ; and more than many times, swimming free in the breakers at Waikiki, hailing with shout and wave of hand the surfing canoes and boards flashing and zipping to every side, we referred to those days when the farthest we swam together was an eighth of a mile . Jack held back because I could do no more. Deep thinker though he was, and worshipful of the brain-stuff of others, he ever found shining things of the spirit in courageous physical endeavor. I think, in a dozen close years with him, year in and year out, "in sickness and in health," till death did us part, that never have I seen him more elated, more uplifted with delight over feat of one dear to him, than upon one April day at Waikiki. An out-and-out Kona gale had piled up a big, quick-following surf, threshing milk-white and ominous under a leaden, low-hanging sky. At the Outrigger beach no soul was visible ; but a group of young sea-gods belonging to the Club sat with bare feet outstretched on the railing of the lanai above the canoes. Joining them, Jack inquired if they were "going out." and looked at the others quizzically. And another, "This is no day for surf-boards and a canoe couldn't live in that water." "But we are going to swim out," Jack said. "You'd better not, Mr. London," the boys frowned respectfully. "You couldn't take a woman into that surf." "You watch me,"
Jack returned. "I could, and shall." It was not in order to be spectacular that Jack took me out that day. With the several weeks' training he had given me in sizable breakers, he expected as a matter of course to see me put that training to use. And I felt as one with him. river a tangled mass of thorned algaroba and other prickly vegetation, which, with a wild wrack of seaweed, made the shallow water almost impassable. Very slowly we forged out, and at length were in position where the marching seas were forming and overtoppling. ... scrupulously Jack's quiet "Don't get straight up and down straighten out keep flat, keep flat!" I managed not badly to breast and pass through a dozen or more that followed fast and faster, almost too fast for me to get breath between whiles. But when I finally ventured "I think I have had enough," immediately Jack slanted our course channelward where the tide flows out toward the reef egress. Once in this smoother water it was plain sailing, so to speak, except that after half an hour we found we were not getting anywhere worse than that, drifting willy nilly out to sea. 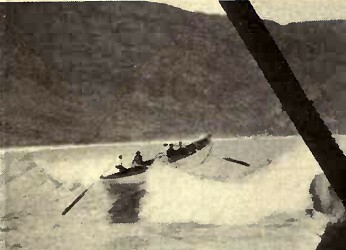 By now, the young crews of the Outrigger had followed with their boards, fearing we might come to grief, and upon Lorrin's advice we made back toward the breakers and out of the current, and "came in strong" with our best strokes to the Beach. Again, one less stormy day, in deep water Jack was seized with a cramp in his foot, from which often he suffered at night, a painful and increasing symptom of break down in his ankles, accompanied as it was by rheumatism in both wrists and ankles. Between us, he floating, I treading, we rubbed and kneaded the foot as best we could, until a strange surf-boarder hove in sight, fighting seaward, whom I hailed at Jack's suggestion through set teeth. We got Jack on the board, and went more thoroughly at the ironing-out of the cramp with our palms, and presently he was able to swim ashore. There was nothing whatever remarkable in these two incidents. followed his directions and knew that he would give instant heed, in the first instance, when I claimed weariness. tual achievement, because it called for spiritual courage. "I'd rather see my woman be able to do what she did, than to have her write the greatest book ever published or unpublished" tersely summed up his philosophy of values. The newest brood of surf -boarders had learned and put into practice angles never dreamed of a decade earlier. Now, instead of always coasting at right-angles to the wave, young Lorrin and the half-dozen who shared with him the reputation of being the most skilled would often be seen erect on boards that their feet and balance guided at astonishing slants. Surf-boar ding had indeed come into its own. And the sport never seems to pall. Its devotees, as long as boards and surf are accessible, show up every afternoon of their lives on the Beach at Waikiki. No athletic-field dream quite compensates. It remains the king of sports. Geoff Cater (2007-2017) : Charmian London : Surf-riding at Waikiki, 1907-1917.